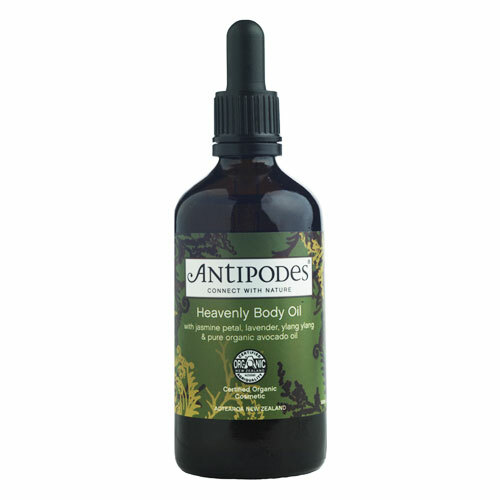 ANTIPODES Heavenly Body Oil is an indulgent body moisturiser with an Organic formula ideal for extremely dry skin types. 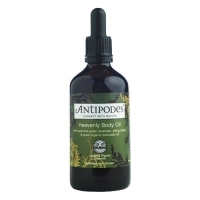 Loaded with 8 Avocados in every bottle, Heavenly Body Oil has a luxuriously light formulation which rejuvenates the appearance of the skin buy nurturing and replenishing it with lost nutrients including Omegas and essential Fatty Acids. An enchanting mix of Lavender, Rosewood, Ylang Ylang and Jasmine is reminiscent of a star filled summer night and will seduce your soul whilst the pampering blend of nutritious oils including Macadamia Nut and Jojoba help to deeply moisturise and soften the skin whilst protecting against signs of ageing and free radical damage. Heavenly Body Oil is suitable for daily use and leaves all skin types feeling beautifully moisturised, nourished and velvety soft.